Ahh, mes amis! Here we are with another week of traveling home from the ‘burbs and eating burgers. This time I decided to venture through Chestnut Hill, stopping into Paris Bistro inside the Chestnut Hill Hotel. A burger when there’s all this delicious french food on the menu? But of course! What Parisian doesn’t love a good “Royale with Cheese”? And this one comes topped with Gruyere cheese and sweet pepper relish. The burger came out topped with adorable little cornichons and was cooked perfectly medium on the inside. The meat was just so succulent and juicy, I didn’t even need to put ketchup on it. The house baked brioche bun was soft with a nice, outer crust (much better than those generic shiny brioche buns at other places). It was also lightly toasted and extra buttery which added a great taste to the burger. The Gruyere was gooey and slightly salty. That, combined with the flavor of the peppers (which I picked off because I’m not a big pepper person), really complemented the meat. There were also sliced plum tomatoes and lettuce as additional toppings (hidden by the bun), and a side of aioli that almost tasted like the “Bloomin’ Onion” sauce but not as overpowering. I smeared a little of that sauce on the bun and barely tasted it – but in a good way! I would have been angry if the aioli was the only thing I could taste. 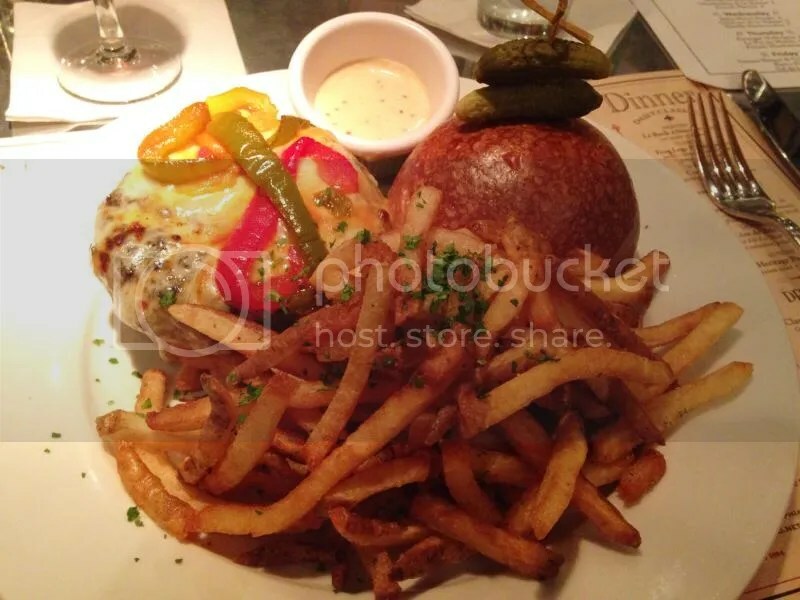 Everything about this burger was so delicious and amazing – Or should I say – C’est Magnifique! Posted in brioche, buns, burger, burgers, Chestnut Hill, french, gruyere, Paris Bistro, sweet peppers. Bookmark the permalink.